You honestly can’t have too many. For me, on keto, cauliflower rice is my fallback. It also helps that cauliflower is such a versatile ingredient: you can rice it, couscous it, turn it into pizza, turn it into a cheesy bake… Before I got on keto, cauliflower was that throwaway vegetable that you’d only eat if absolutely nothing else was available. Now it’s the cornerstone of my diet. And it should be yours too. 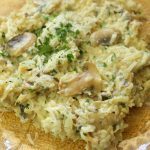 This cauliflower rice mushroom risotto is a complete guilt free treat. It’s high in fat and full of creamy and cheese deliciousness. You can also add in anything you like. Veggies like broccoli or asparagus or if you want some meat to sink your teeth into then some chopped ham, bacon, shredded chicken, quite a few options at your disposal. Even when it comes to the cheese you can use anything from blue cheese to a mature cheddar. The cream I am using is a local 25% fat cream but if you live in American heavy cream will work, or if you live in the UK, double cream. NB: Cruciferous vegetables like broccoli and cauliflower are known to give some people flatulence, though personally I haven’t experienced this on keto. Though full of nutrients, these vegetables’ sulfur compounds are what gives it its room clearing properties, but lots of people have reported significant decrease in flatulence after taking probiotics or probiotic-rich foods like kefir. Just putting it out there. 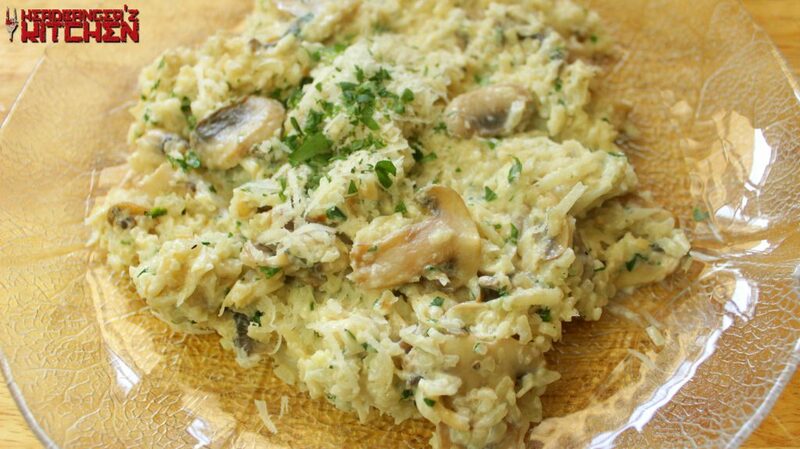 A creamy and cheesy risotto made with cauliflower rice.